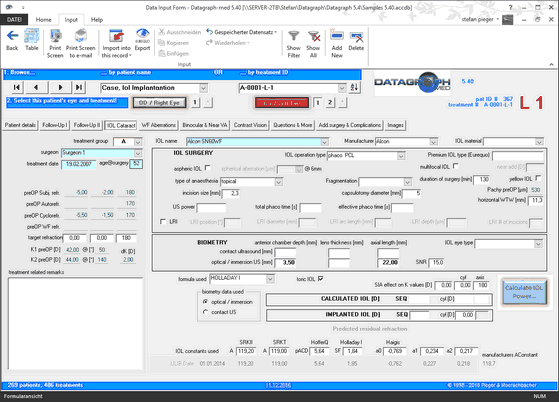 Starting from Datagraph version 5.20 we offer more cataract/IOL related features. If you select 'IOL' as surgery type and Lens Implants' as surgical device a number of IOL specific fields with parameters related to cataract surgery will be shown on a 'IOL Cataract' tab. A number of frequently used IOL types can be selected from the 'IOL name' drop down list. By default this will copy IOL constants from the ULIB database (http://ocusoft.de/ulib/), provided for the Zeiss IOL Master 500. You can enter and specify own IOL constants or import a newer version of the ULIB list of IOL constants under 'IOL Types and Constants' in the Defaults section. Fields for aspheric or toric IOL became active when the related check box is active. IOL power calculation is disabled in the regular version of Datagraph-med and used for research only at this stage (Datagraph version 5.50).